Volume Control Circuit - Treble Bypass Filter. Also known as a Treble Bleed Filter. Here's a simple fix to stop losing treble/presence when the volume is turned down on your electric guitar. This device helps to preserve the amount of brightness as the volume pot is turned down. It is wired across the two hot terminals of the volume pot. 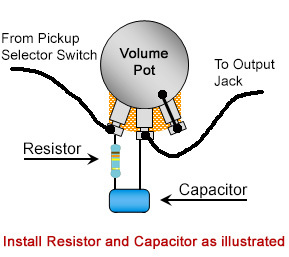 A rudimentary way of looking at it is the capacitor allows some of the high frequencies to pass around the volume pot direct to the output and the resistor limits the amount of them that get past. This circuit works best with 250k volume control potentiometers and true single coil pickups. This design works better than a 'capacitor' only or the parallel 'resistor/capacitor' design that some makers fit to their guitars, so if you didn't like theirs try this one. The values of both the capacitor and resistor are the same as you would find on world renowned pickup manufacturer Chris Kinman of Australia and his Strat® pickup harness sets such as his K7 and K9. 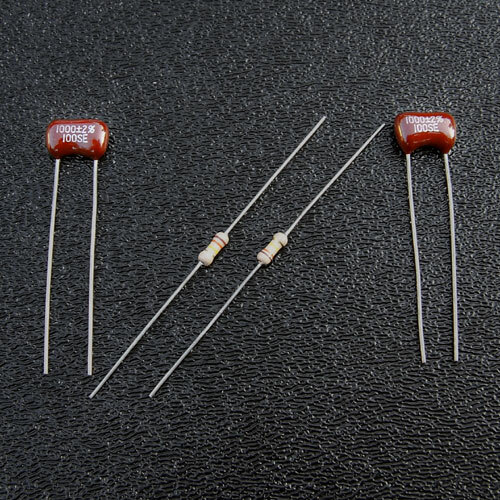 Actual style and type of capacitors and resistors you receive may vary from those pictured above due to changes in inventory, but the resistance and capacitance values will be the same and the treble by-pass effect of the installed circuit will be the same.